Hi all, I am new to the forum and would like an ID for two plecos I got from a friend. She doesn't know what they are and can't remember where she purchased them or how much. I took some pics to help. I've looked through the threads and see some types of plecos that are very similar to mine, but I am no expert at all with them. This is what I have so far, I hope the pics are good enough. 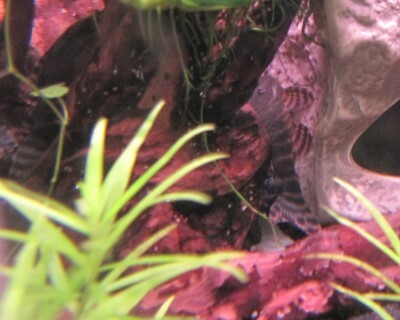 I have two plecos, very similar, I believe they are the same, so the pics are of one or the other. This pic is taken in the dark, using a flash, so the colour is yellowish. Notice the extension of the tail fin, opague fins and squiggly pattern on it's head, how it doesn't match the body. View from the back, all these pics are overexposed to brighten and try to show more detail. I just noticed this pleco has a bit of a spotted pattern on it's tail. It's some kind of Tiger, definately not a clown. So definitely, one has polkadots where the tail splits at the end, and the other one's tail continues with stripes. They both look about the same size, around 5", same colour but one was a bit smaller and fatter looking (from above) when I was acclimating them, wish I had looked closer at them then. I wanted to leave them alone for a while, to get used to the tank, and not bother them trying to take pics. I noticed just now when they came close to eachother, one really faded, I don't think that's a good sign I was hoping maybe they were M/F and would pair off, I also didn't notice any odontal growth yet........I'll give them more time. Just curious, like I said, I am new to plecos, I find them very interesting, but am learning, is there a reason in particular you say they are definitely not clowns? I said they're not clowns because they're definately some type of Tiger. Try looking at L-226 (I think) on planet catfish. I had L-002 before that looked the same but more orange. Ok, yeah, I just google imaged it, and I so see some similarities, even the polkadoted tail in one of the images. I will check out planet.catfishes; L226. thanks!! K, just checked them out and it says they only get to be 3.9". The ones in my tank are longer, from tail tip to head, if that's what it means to size them, but it's close, closer than I was!! Stop measuring where the tail begins. Possible L-15 Peckoltia Vittata They have some 4 inches long at Big Al's in Mississauga. 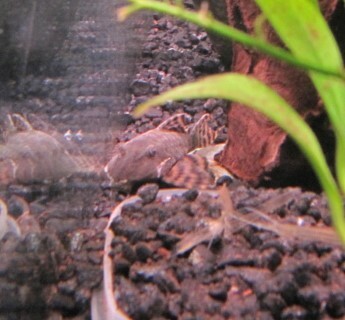 Thanks CP Donator, I looked again at the pics I posted, and it is not very obvious in them except for the first, but the pleco's heads in my tank look nothing like the rest of their bodies. Their head's patterning is tight squiggly lines, while the rest of their bodies are banded. 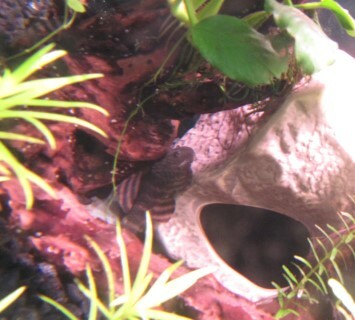 I would say its a L103 clown pleco. In a batch of wild caught clown plecos L103 that I order on a regular you will find all kinds of slight variances because they come in so small. The hard part of comparing it to a clown is that clown plecos bought in stores might not even be clown plecos sometimes lol. So to me it doesnt look like the L015 I owned at all the stripes are very narrow but I got mine at around 3 inches. Ok, I am 100% confused. I guess I will have to get more pics and try again some time. Eventually, I'd like to know the genders of each. 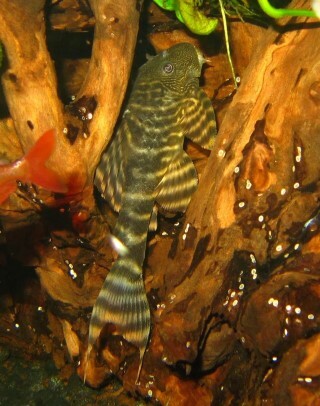 I thought I'd start with what type of pleco they were LOL. I am getting conflicting opinions, which leaves me in my original dilemma. I do not know what name they were bought under, as I got them from a friend who can't remember anything about them. They always hide during the day in a hollow artificial log ornament, open at both ends with little holes big enough for them to swim into here and there. I've been feeding them mostly catfish staple and algae pellets at night. 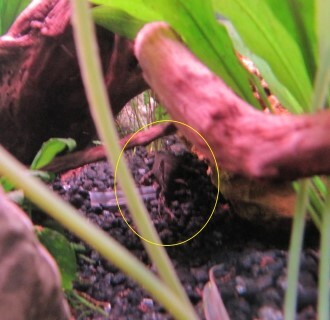 They are gone by morning, not sure who exactly eats them, but there is pleco poop all over the gravel in 24hrs. I don't know what else to add at this time. I googled a clown pleco this is what comes up http://www.petfish.net/kb/entry/211/, this is what they look like in my store as I said they come in varieties of pattern and colour but this looks like yours and like 90% of L103s i order. But I have a 4 inch L015 and a 4 inch L103 instock so i can even put them in a bucket so you can see them side by side. As I said if you come in I have no problem showing you what I know about fish as many people here have probably seen you introduce yourself and ill spend hours and treat you like family basically lol. Just ask for Steve. Well, if it were a L397, I would be a very happy girl!!! Those are gorgeous. But I don't think they are. They look similar in makings, but they don't have that beautiful orange colouration. My friend couldn't take her tank with her when she moved, so instead of letting all her fish die, I took care of the tank while I could, took what fish I could, and found homes for the rest and the tank. She has no idea what they are though. One of those fish you posted look similar, with the separate head bit, and the colour is more 'on', it's just, like you say, they label so many plecos as clown plecos, even when you google them, there are so many differences. I bet half the average pleco owner (not pros like you two) don't even know what they have. Maybe they don't even care. But I do. What did you mean by "clown pleco theyre a great beginner pleco lol not to breed but to keep"? 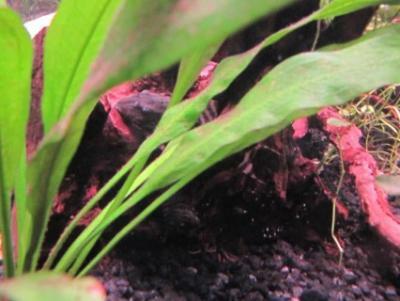 I am new at plecos, never had them, but I've had tanks (fish and plants) for years, and like to breed fish. They are not good for beginners to breed, or just hard to breed? I guess I could read that on my own lol, just wondering cuz you said it.